Are Balotelli & Liverpool already on a collision course? 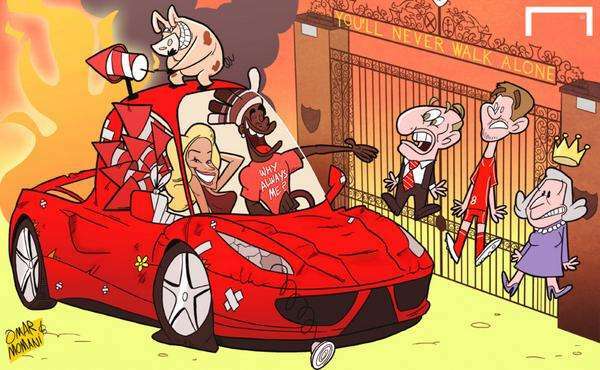 Liverpool are already discovering just how much of a fight they could be facing in their bid to tame Mario Balotelli. Reds boss Brendan Rodgers admitted that signing the controversial 24-year-old from AC Milan was a “calculated risk” and believes he can get the best out of the striker. But just two days into life as a Liverpool player Balotelli is already butting heads with the club over where he will live for his second spell in England. As part of Rodgers’ plan to keep the striker out of the headlines, the club are keen to house him close to Liverpool and around a number of his new team-mates. Captain Steven Gerrard lives in Formby and club chiefs hope the experienced midfielder can help to keep an eye on Balotelli if he moves in nearby. The Anfield club have lined up a number of viewings for some plush pads in the area on Wednesday, but Balotelli is digging his heels in and wants to be closer to the hustle and bustle of city life. But not necessarily Liverpool city life; the Italian is keen to base his young family closer to his previous €17,600-per-month mansion in Alderley Edge, Chesire, roughly 50 miles from Formby and much closer to Manchester. The striker is currently staying at the Lowry Hotel in the centre of Manchester – just over the river from Carlos Tevez’s favourite local restuarant – and his mother still lives up the road in Wythenshawe, just eight miles from his old mansion. Balotelli forged a reputation as an eccentric character in England during his time at Manchester City, with tales of setting off fireworks from his bedroom window at ‘The Lodge’, throwing darts at youth team players and going shopping at John Lewis to buy an ironing board and coming back with a quad bike. He was unhurt after crashing his Bentley near Deansgate Locks in 2012, and later hit out at English life upon his arrival at AC Milan last January. “Good things? Only when I get to Carrington to train, so my team-mates and manager,” he said. But now he is back and Liverpool have been made well aware of Balotelli’s constant need for stimulation off the pitch, and they plan to set up a number of activities to help keep him occupied. Unlike many footballers, though, the former AC Milan man ‘hates’ golf and would rather drive his luxury cars around town or go shopping. During his second spell in Milan he posted a picture of himself posing with a gun on Instagram, sparking outrage in Italy. On another occasion he refused to sign autographs for some Rossonerri fans in Switzerland, prompting them to cover his car in toilet paper. Liverpool’s approach highlights how far they are willing to go to get the best out of their latest investment and the man charged with replacing Luis Suarez. Rodgers and the club know that they will have to do all they can to harness the 24-year-old’s potential, and have already shown great attention to detail in monitoring how he lives his life beyond training at Melwood and matches at Anfield. But with Balotelli already making it known he wants to live life on his own terms, Liverpool may well have a battle on their hands.